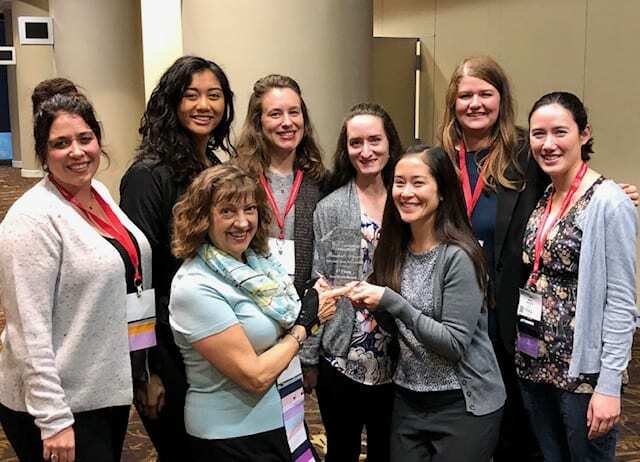 San Jose State Occupational Therapy students and Department Chair Wynn Schultz-Krohn, far right, were honored at the American Occupational Therapy Association Conference for raising the most money as part of the St. Catherine Challenge, which benefits professional research in the field. 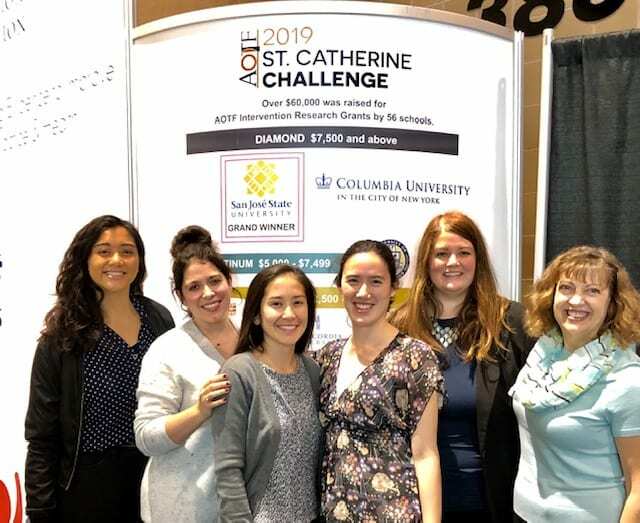 Members of San Jose State University’s American Occupational Therapy Foundation Student Honor Society, Phi Theta Epsilon (PTE) and the Student Occupational Therapy Association, outdid themselves this year during an annual fundraising event that supports professional research initiatives. The Spartan students raised more than $9,000, exceeding the efforts of any other PTE chapters in the nation. Chelsea Holsonbake, whose research group is working on a retrospective program evaluation of a multifactorial fall prevention program for older adults, said the students even got some clients involved in the fundraising efforts. “Some worked on integrating affected limbs while making cotton candy while others worked on community reintegration and social skills while selling cotton candy,” she said. Clients to the on-campus OT clinic helped with the fundraising efforts through they worked on integrating affected limbs while making cotton candy while others worked on community reintegration and social skills while selling cotton candy. Research opportunities are key to the graduate student experience in OT, and at SJSU, students engage in three research classes and complete a final research project. During spring break nearly 40 students presented their research projects at the American Occupational Therapy Association Annual Conference, a peer-reviewed professional conference. “Research is so important in the field of OT because we want to know our interventions are best for our clients, not just from our own observations but also from research and replicable data,” said Millie Book, who anticipates completing her master’s in OT in fall 2019. Her research on friendships and social participation among young adults with autism will prove useful after graduation when she hopes to work in a rehabilitative or pediatric setting helping individuals with sensory integration techniques. Monica Ondriezek, who will also graduate in fall 2019, has been conducting a historical narrative analysis of the OT department chairs. Kimiko McNeill, who plans to graduate in fall 2019, is working on the same research team as Ondriezek on the history of the OT program. Department chair Wynn Schultz-Krohn and OT students pose with their first-place award for raising the most money of any other student group in the St. Catherine’s Challenge. Katie Poisson, who plans to finish her master’s in fall 2020 said she was initially drawn to SJSU’s program for its location, faculty and the opportunity to study abroad. Serina Murphy, also an intended fall 2019 graduate, is involved in research aimed at understanding how simulations, in comparison to traditional didactic teaching, effects social problem solving to potentially enhance the occupational therapy curriculum. Murphy noted that occupational therapists can work with clients across the lifespan and she is considering the possibility of working in a neonatal intensive care unit. “I’m looking forward to experiencing all I can to build a strong foundation and become a successful occupational therapist,” she said.